Brilliant! Technology at it’s best. As of 10am PDT (6pm GMT), the final release of PP3 for WHS is available. Now available from the AppStore (and if you’re reading this, then it also works!). Over the years (quite a number in my case), I have purchased a large number of Creative sound cards. Generally, I went for the higher spec ones (AWE64 Gold with extra sugar, etc). My last purchase was in January 2007 of an X-Fi Elite Pro. Not a particularly cheap purchase, you’ll admit, at €360. Shortly after that, I started testing Microsoft Windows Vista, and was pretty impressed except for the lack audio driver support. I had to accept the statement from Creative that as Vista had not officially launched, they would not provide support it. Fair enough, you say. Once Vista launched though, I wanted my drivers. I still want them. Doesn’t look like I’ll get them from Creative though, and now it seems that Creative want to make sure that I don’t get them from anywhere else. Daniel_K is a regular in the Creative support forums who has taken it upon himself to develop drivers which Creative can’t/won’t release. He has helped a lot of people to get Creative hardware working on Vista, but now Creative want him to stop. Creative have, in a thinly veiled threat, told him to cease and desist, or else…don’t-touch-my-IP-or-I’ll-break-your-legs-cuz-you’re-stopping-us-forcing-people-to-buy-new-cards type of thing. You can read it all here (currently with 1,714 replies…and heading for a quarter of a million views), but suffice to say, I personally will never buy nor recommend that anyone else buys, Creative hardware, as they just want you to junk whatever you have and buy another piece of their unsupported kit. 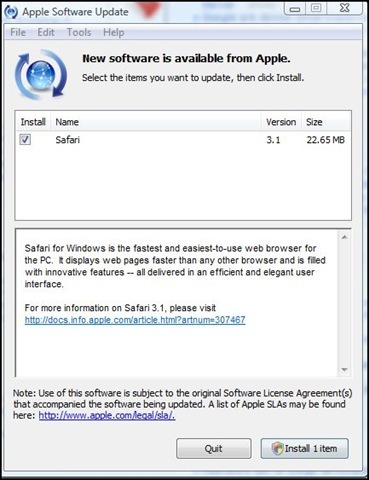 Apple offering Safari to Windows users? I have never had Safari installed on my PC (on my Mac Mini, yes), so I can’t see how I would “select the items you want to update” given that there’s nothing to update. Correct me if I’m wrong, but if Microsoft tried this on another OS, we’d all be reading about the legal ramifications and EU competition commissioners spouting fire and the like. Before you flame me, yes I can and did click on quit, but this update is always there and there’s no option to decline this update permanently. I’m also sure that, buried deep in some EULA I agreed to ages ago, I gave Apple the right to do this. It doesn’t mean I have to like it, and I don’t. If I want Safari on my PC, I’ll go to apple.com and download it when I want it. At this point in time, I don’t. Thanks to www.komplett.ie (and payment of course), I got my RTM copy of Windows Home Server yesterday and installed it last night. I’m a happy bunny now that my RC copy won’t expire, and I can get access to all my music, photos, etc. anywhere in the world via my personal homeserver.com sub-domain. This product is going to be HUGE, maybe not with the V1 we have now, but with the suggestions being posted to MS for future inclusion (media server with multiple TV cards feeding recorded TV to local PCs, etc), watch this space.